Note: Ran 5th on December 31st in his only 2-year-old start. Won his first race of 2006 by 8 lengths in a maiden claimer, then faded badly to lose by 19 lengths in the San Vicente behind Too Much Bling. 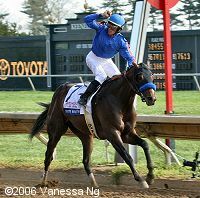 Shipped up to Golden Gate to run second in the California Derby behind Cause to Believe then shipped to Kentucky where he was a runaway winner in the Blue Grass at Keeneland. Looks like a pure speedster who only runs well when on the lead and doesn't run at all if he can't get out front early. Duelled for the early pace in the Derby with Keyed Entry and faded badly to finish 16th.